Recorded in Studio 10, DeutschlandRadio, Berlin, Germany on October 6, 1995. Recorded live for radio broadcast with a studio audience. Recorded in the Glenn Gould Studio, CBC Broadcast Centre, Toronto, Canada on June 11, 1996. Recorded for broadcast by the Canadian Broadcasting Corporation. Recorded in Kilburn Hall, Eastman School of Music, Rochester, New York on February 20, 1996. 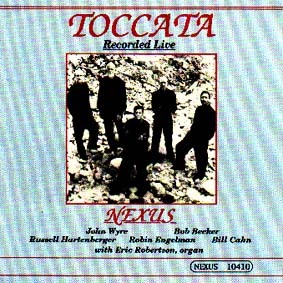 For its 25th Anniversary Concert, this performance was recorded live in the hall where NEXUS gave its first concert in 1971. Recorded live at St. Paul’s Anglican Church, Toronto, Canada on May 11, 1996. Individual recording credits listed with each piece.